This impressive pearl was the central drop to Countess, later Princess, Katharina Henckel von Donnersmarck's beautiful natural pearl necklace, which she is pictured wearing in her most beautiful portraits. The necklace was made for the Countess by Chaumet in 1896, of whom she was a loyal and appreciative client. The Princess had not only commissioned the fabulous corsage ornament, also visible in her full length portrait, from the famous French maison, but also two other exquisite colliers de chien offered here as part of her collection, lots 388 and 389. The Chaumet necklace pictured in this portrait was designed to support either five important natural pearls with diamond caps, or five pear-shaped emeralds. The pearls were each capped with a delicate curling snake, a motif indicative of the craftsmanship of Chaumet. Aside from its signature and provenance, this important pearl already stands out as one of the top twenty largest recorded gem quality natural pearls. 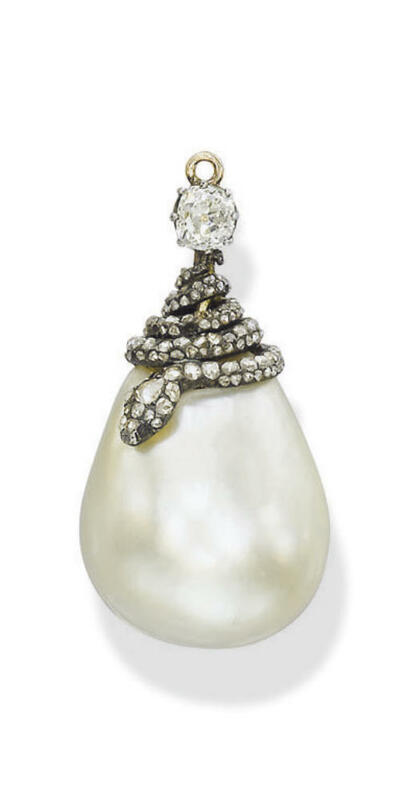 Comparative in size with such other drop-shaped pearls as Queen Victoria Eugenia of Spain's pearl, weighing approximately 224 grains, and the Sara/Tavernier 3 pearl, weighing approximately 220 grains (and sold Christie's Geneva on 21 May 1992, for $470,000), the pearl offered here is an equally important gem in its own right. However, that such a large pearl, weighing 222.5 grains, was furthermore mounted by Chaumet as the central drop of the necklace belonging to Princess Katharina Henckel von Donnersmarck, undoubtedly places it amongst not only the largest known natural pearls, but also the most historic.